Getting enough sleep is an important part of staying healthy, no matter what your age. This is especially true, however, for individuals who have been diagnosed with a chronic illness like dementia. As people age, their sleep patterns often change, and dementia may exacerbate this problem. Luckily, there are several tools that can help your loved one improve the quality of their sleep. Once you learn how to help someone with dementia sleep, you can implement several key strategies to keep your loved one well rested. Even the healthiest adults can experience changes in their sleep patterns as they age. In fact, some studies have suggested that, starting in mid-life, an individual’s total sleep time tends to decrease by nearly 30 minutes per decade. Aging adults are also more prone to sleep-related disorders like sleep apnea. Finally, aging adults – especially those with dementia – are more likely to find themselves falling asleep earlier due to changes in circadian rhythms. All of these issues can plague any aging adult, but the symptoms are often worse for individuals with chronic illnesses like dementia. 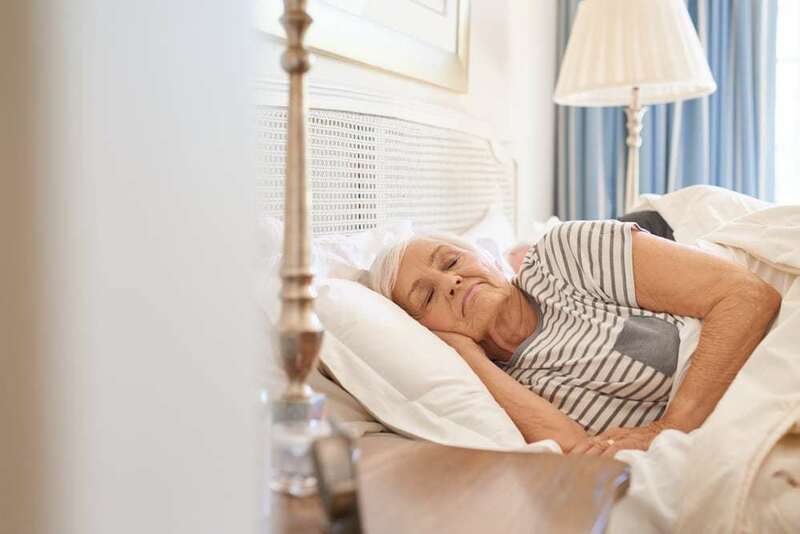 As dementia impacts the brain, it tends to affect the individual’s ability to achieve deep sleep, making seniors with dementia more likely to suffer from sleep-related ailments that impact many older adults. What time do they usually go to sleep at night and wake up in the morning? How frequently do they have trouble falling asleep at night? Do they often snore or stop breathing while asleep? Do they walk, eat, or complete other activities during sleep? Are they usually tired during the day? With the help of your loved one’s sleep journal, a doctor should be able to determine the underlying causes of your loved one’s sleep problems and make recommendations. Many seniors with dementia struggle with changing circadian rhythms, which tell us when to go to sleep and wake up. That’s because dementia can disturb the body’s internal clock, causing dementia patients to get day and night confused, so that they’re sleeping and waking at odd times. Light therapy is one way to help your loved one regulate their circadian rhythms. If possible, make sure that your loved one is exposed to outdoor light for at least an hour a day, or half an hour in the morning and evening. Even better, take them for some light exercise, like an outdoor stroll. An outdoor walk is especially helpful – studies have shown that regular walking can improve nighttime sleep in dementia patients. Finally, for seniors who can’t get outside, a bright light like a light box can also work well. One of the easiest ways to help your loved one sleep is to optimize their sleep environment. Keep your loved one’s sleep environment dark and quiet at night to help them relax. Consider adding heavier curtains or blackout blinds to keep outside light from entering the room. Check the temperature and ensure that your loved one is not too hot or two cold. All of these factors can contribute to a comfortable sleep environment. Establishing a bedtime routine for your loved one is one of the most important ways to improve their sleep quality. This starts with maintaining a consistent bedtime and wake-up time. As nighttime approaches, prepare your loved one for restful sleep with relaxing activities. They might enjoy watching a funny or heartwarming show on television or listening to calming music. Bedtime can also be a great time to sit down with your loved one and reminisce on positive memories. No matter what, focus on making bedtime a pleasant, consistent time of day. If you’re unsure how to help someone with dementia sleep, the Crossings at Riverview can help. Our highly trained staff members understand the value of memory care and will support your loved one with a smile. With our help, you can rest easy, knowing your loved one is safe, cherished, and benefiting from the highest level of independence possible. We provide memory care services to seniors at various levels of the disease process, addressing the challenges that arise with compassion and respect. Call us at 813-671-0222 or contact us online for more information.